My co-worker is having a baby boy, so I had to abandon fruits and find a more manly hat. Enter the dinosaur! Rawr! I created this pattern by knitting a basic baby hat with a rolled edge, k1p1 ribbing, and stockinette stitch. Then I crocheted three triangles. (I didn't stuff mine, but I saw a few other people online who did.) Then I sewed the triangles down the back seam of the hat. Have any other manly baby ideas? I love love love the new 9 Months of Knitting book by Alexa Ludeman & Emily Wassel. I don't have. Link handy, but it's on Ravelry. Everything in it is unisex. 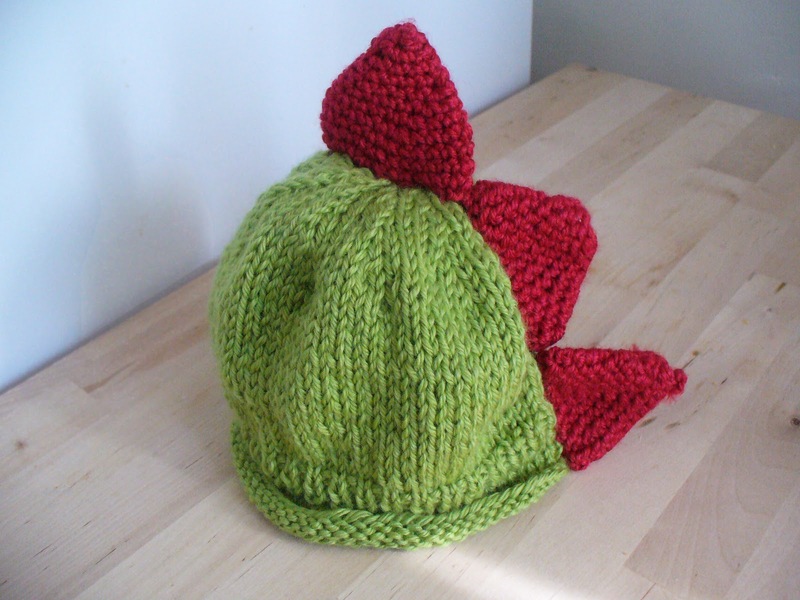 I'm going to make my son the Hunter Hat next.